Recent news headlines have said there is a potential Alzheimer’s treatment in the works that could be ready within 10 years. The hope comes from a study that has been using ultrasound and tiny bubbles to break up the plaques that build up in brains. It’s these plaques that are believed to block the transmissions between neurons. Tests of this process were used on mice and proved successful. Australia’s government recently approved $10 million for the research to move to human trials. If the human trials go well, some feel that there could be better treatments available in the next decade. Those treatments would likely focus on people who are in the very early stages. Things You May Not Realize About Alzheimer’s Care. If your mom or dad already has Alzheimer’s, this news may not help them, but it could help you. For now, you’re likely providing some of your parent’s care. There are things you may not know about caring for Alzheimer’s. One thing that often takes families by surprise is the timing. 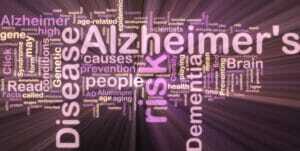 Seniors often have Alzheimer’s for years before it is diagnosed. The first stage of the disease doesn’t seem too alarming. As you progress into the middle stage, your mom or dad is probably struggling to pay bills or count money at a store. Symptoms may seem to level off or increase at an alarming rate from there. Your parent may not always agree with you. When there is a disagreement, it can be disheartening. Every case is different, but it’s not unusual to be called names, hit, pushed away, or yelled at. You can ask your mom or dad what to make for dinner. You make it and plate it. Your parent blurts that it is gross. Your mom or dad refuses to eat it and wants you to make something else. You’ll end up spending more time in the kitchen while trying to get your parent to eat. You also may find yourself forced to cook the same meals over and over. In the late stages, your parent will be more likely to forget your name and who you are. You need to keep things like knives locked away. You don’t want your mom or dad to grab a knife and chase you out of the house. Respite care is also something you must consider. You’ll get a break from your parent. Your mom or dad gets a break from you. Caregivers are there to make sure your parent is safe and cared for in your absence. The staff at Home Care Matters is available to talk with you and your family about all of your needs. Home Care Matters is a home care agency providing quality and affordable caregiver services in Buford, GA and the surrounding areas. Call (678) 828-2195 for more information.